Netherrealm Studios has just announced the release date for the second Mortal Kombat X DLC character Tanya and the Kano, Sonya and Liu Kang klassic skins. The four DLCs are part of the Klassic Pack #1 which is also part of the Kombat Pack. 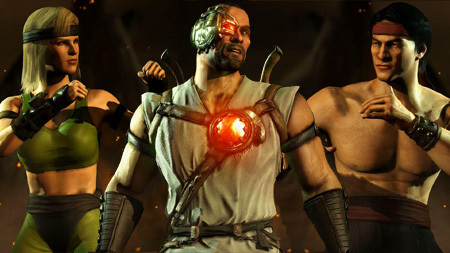 For Kombat Pack owners all these will be available on June 2nd. Both Tanya and the three klassic skins will also be sold separately and available to everyone on June 9th. Similar to Jason, a Tanya Live Tower will also be available and will let you sample the character before buying it. If you tried to visit us yesterday, you might have noticed that the website was either slow or was not responding at all. The reason was that a major social network website was hotlinking hundreds of resources (images) in an article that was being read by hundreds of people at the same time. As a result our server was constantly operating under conditions similar to those created by a standard DOS (Denial of Service) attack. 6 frustrating hours later, hotlink protection and several communication attempts with the network's staff members resolved the issue. This however pointed out an important performance and stability issue of the current server configuration. We took several different actions to protect the server and to ensure its problem free operation in the future. And while nothing is certain, we were amazed by the increase in speed and overall performance we managed to achieve. We made some major changes, including the utilization of the NGINX server, so, we are asking you to report any problems and bugs that you encounter. 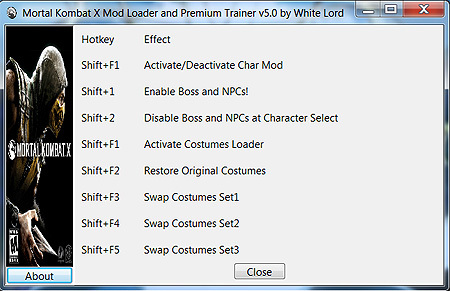 The trainer is currently in development and more and more mods are being added every day. Want to learn more about the trainer and get your hands on it, take a look here and don't forget to leave some feedback. Your input is important to the growth of the Modding Kommunity. A few days ago, we already reported about the latest (May 14th) patch for Mortal Kombat X. The patch brought a lot of changes and included a free Klassic Reptile skin. Read the news for more details. 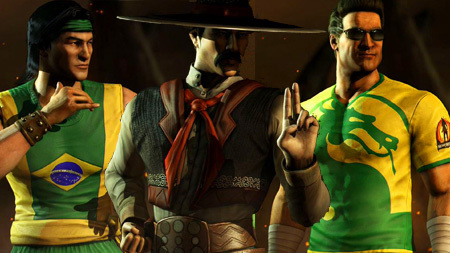 The pack includes Brazil themed skins for Johnny Cage, Liu Kang and Kung Lao. The entries for these skins have already been added to the character viewer to tease the fans, so lets take a closer looc. The first skin is Soccer Johnny Cage and to be honest, I can't wait for it to be released. This is in fact my favorite of the three. I really like the dragon logo on the front of the T-shirt and the Netherrealm logo on the shoulder. Actually I am currently asking myself if someone is going to make T-Shirts like this. The second one is Capoeira Liu Kang. Ever since I played with Tekken's Eddie Gordo I was hoping that Mortal Kombat will have a character like this. 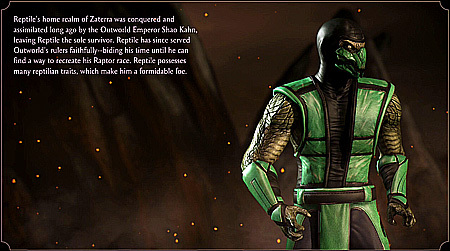 The closest we got in the past was Kai in MK4. Liu Kang fighting style is very different from Eddie Gordo's but the skin still reminds me of him. Kung Lao's gaucho skin really made me scratch my head, as I had no idea what a gaucho is. For those of you who feel the same way, in Brazil, Argentina and several other countries from the region, gauchos are similar to cowboys. Unfortunately its still unknown when all these skins are going to be available, but I think it's going to be soon. Which one of them is your favorite, let us know. This pack will include 3 klassic skins from the Mortal Kombat 1 era. The skins are for Liu Kang, Kano and Sonya. The first skin that we are going to take a look at is for Kano. For me personally there aren't much similarities between this skin and Kano's look in Mortal Kombat 1, apart from the white color itself. It is true there isn't really much detail in MK1 to draw inspiration from, but there are sill some very detailed pictures of Rich Divizio in the costume. Take a look at Kano's Fatality from the original game to see what I mean. Lets now take a look at Liu Kang's skin. It's very difficult to say how close the skin represents the original, since we don't see much of the pants. From what I can tell, the hair is short corresponding to the hair style of actor Ho Sung Pack in MK1. Lets see how he looked back then. And now we come to my favourite of the three skins, that of Sonya. The skin represents the look of Elizabeth Malecky really close. The only difference that I can currently see is the face, but I believe that the developers were not allowed to make her look like Elizabeth. Lets look at Sonya's Fatality from MK1. The patch made changes to Tanya's presence in the game. The first thing I noticed after installing the patch was that Tanya's select screen icon was much brighter then before. A normal select screen render was also added for. Tanya was also added to the characters viewer and you can even see her bio. Here is however where it gets really interesting. Tanya's Fatalities and Brutalities have been added to the Finishers Kollection. Tanya's Fatalities are: Bloody Boots and Edenian Drill. And her Brutalities are: Top Off, Romp Stomp, Backstabbed, Watch This and Pop pop. I was a bit disappointed that she did not get her Klassic Mortal Kombat 4 Fatality. Krypt statistics was also added and to help you if you want to know whether something still needs to be unlocked or not. - Many movelist frame data corrections. - Corrected many normal attacks that were intended to be 0 or negative on block were being overridden to be +2. - Hitting Front Punch + Back Punch + Front Kick at the same time at the special cancel window will no longer cause an enhanced move to come out. - Removed the ability to mash normal attacks while continuing to block after blocking an attack. - You can no longer cancel into an enhanced interaction during the first 10 frames of some block stuns. - Versus Session Stats are now correctly award as wins/losses when you pause and exit to player select or restart match (Versus Session Stats can be turned on in Main Menu > Options > Game Play). - Fixed several characters being able to attack on the first frame of a jump. - Added unlock counter for Krypt. - Fixed an issue that was preventing some players from joining an in-progress Ladder, KOTH, or Team. Battle match from a chat lobby. - Ping meter accuracy improvements. - You can now choose to not play a Ranked Match if the connection is below the set threshold. - Matchmaking improvements when finding a Ranked or Player Match. - Player Skill Rating algorithm improved. - Fixed crash occurring when receiving online VS. Challenge while editing Kombat Kard. - Fixed a crash that sometimes happened when skipping the last fight in the Klassic Tower. - Fixed an issue causing some offline replays to report “playback does not agree." - Cassie (Hollywood) - Assault Force combo can no longer be special canceled after the knockdown. - Ermac (Spectral) – Special cancels done during Soul Accession now award the correct amount of meter. - Goro – Brutal Kick now hits overhead. - Jason – Temple Punch & Shoulder Push no longer auto-correct after it's started moving. - Jason (Unstoppable) – Some special moves were delaying resurrection from happening until the move was over. - Jax – Can no longer get a free hit on opponents after his X-Ray. - Johnny Cage – Adjusted some hitboxes to hit crouching opponents more consistently. - Kitana – Can now perform her X-Ray attack while airborne. - Kitana –No Longer airborne for the first frame after her X-Ray connects which could prevent her from blocking. - Kitana – Gained a new attack on away +3 (Pretty Kick). - Kitana (Mournful) – Glaive Throw no longer disables blocking removing a possible infinite combo. - Kitana (Mournful) – Fixed a bug that causing the 2nd hit of Glaive Return to sometimes not come out. - Kitana (Mournful) – Opponent can no longer by OTG'd after being hit by Staff Grab. - Kung Jin - Cartwheel Smash is now -3 on block (down from +4). - Kung Jin (Bojutsu) – Several staff attacks were not combo damage scaling correctly. - Kung Lao (Tempest) – Cyclone now has 7 startup frames (up from 5). - Kung Lao (Tempest) - Hat Spin & Orbiting Hat will now combo link correctly afterwards. - Kung Lao (Tempest) – Shortened the time it takes for his hat to return after Hat Spin & Orbiting Hat. - Mileena - Tele-Kick can no longer be punished on hit and will combo when special canceled into Air Sai Blast or X-Ray. - Mileena – Can now perform her X-Ray attack while airborne. - Mileena – Improved tracking on X-Ray. - Quan Chi (Summoner) - Demon Spawn's cooldown is no longer reset when a Bat attack hits the opponent. - Quan Chi (Summoner) – Fixed some cases where the Demon Spawn wasn’t going away when Quan Chi got hit. - Quan Chi (Summoner) – Fixed an issue causing Demon Spawn to sometimes instantly disappear after being summoned. - Quan Chi (Warlock) – No longer has the Front Punch, Back Punch, Throw combo (Portal Slam). - Quan Chi (Warlock) – Gained a new special move Portal Scoop (D, F, FP). - Raiden - Shocker was causing combo damage scaling to be reset. - Raiden (Thunder God) - adjusted some combo damage scaling. - Shinnok – Away + 3 (Shin Kick) is now towards + 4 and he has a new away + 3 (Devious Heel). - Shinnok – Can now enhance Hell Sparks & Hell Blast on block. - Shinnok (Impostor) – Now steals Dash Punch from Jax instead of Ground Pound. - Shinnok (Necromancer) – Can now control the location of Judgment Smash & Judgment Fist. - Sonya (Special Forces) – No longer gains meter for Park Drone and Remove Park. - Sonya (Special Forces) - Park Drone and Remove Park no longer resets combo damage scaling. - Subzero (Grandmaster) – Ice Klone now always correctly goes away on block instead of sometimes leaving a Klone with no active hitbox. - Subzero (Grandmaster) – Ice Klone cooldown is no longer instantly reset if it goes away on its own. - Takeda – Slightly decreased the combo damage scaling on Fist Whirlwind & Whip Flurry. - Takeda – Can now do his X-Ray with the Block + Front Kick + Back Kick shortcut on an arcade stick while jumping straight up. - Takeda (Ronin) – When special cancelling into Blade Drop it will always fall the same distance regardless of Takeda's facing. The patch will soon be available on PC as well.